Do you ever drive by a restaurant and it looks so decrepit that it actually beckons for visit? Hey, think of it. 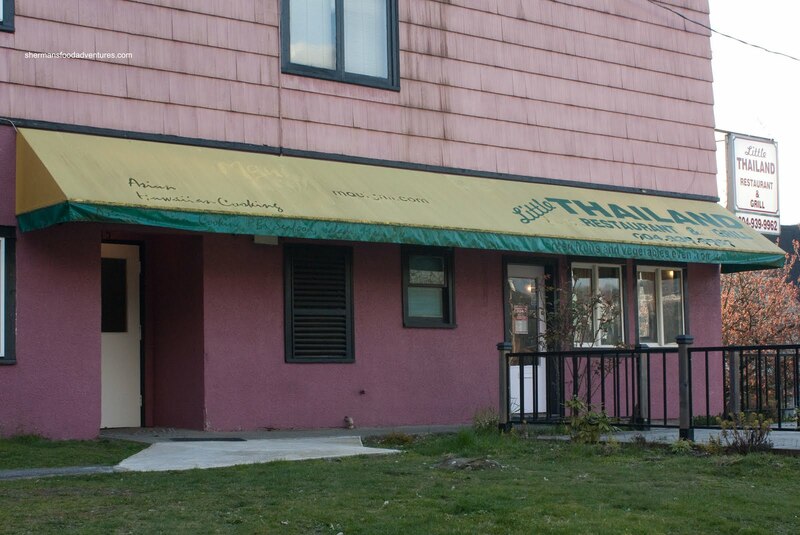 If the place looks like crap on the outside, the food must be good. Otherwise, how does it survive? Well, there is this one place that is right on the main drag in Port Moody that has piqued my interest for some time. Sitting on top of a hill much like the house in Psycho, it has this almost hypnotic quality to it. It's like calling out, "come eat here, it's not really that bad...". Or maybe I am just waiting for Anthony Perkins to come out and yell out "mother"! So for me to visit a dive is not really a new thing. Sometimes, I wonder myself why I visit some places. It's like I'm asking for it. However, it is a real stretch for Rich Guy to visit such an establishment. I had to sell him on it since his frequency for visiting dives is as much as a car parked correctly in a parking spot in Richmond. At first, when we met up outside and he did seem hesitant; but I assured him it would be better inside than out. Surprisingly, I was right (I totally guessed, just wanted to get him in there). The place is nicely appointed and inviting. Another twist to this eating a dventure was the fact we were missing the Canucks game against the Hawks. Turns out it was a good decision since they got pummeled 5-0. 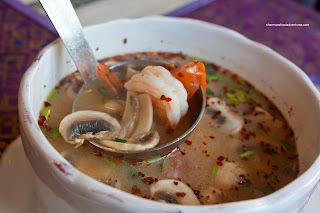 Enough of that, onto the food... We started out with a large order of the Tom Yum Goong. This was quite flavourful while lacking depth all at the same time. There was no shortage of lemongrass, galangal, fish sauce and chilis complimenting the perfectly cooked prawns and mushrooms. However, the soup base itself was not flavourful. After the initial hit of flavours, it fell flat. 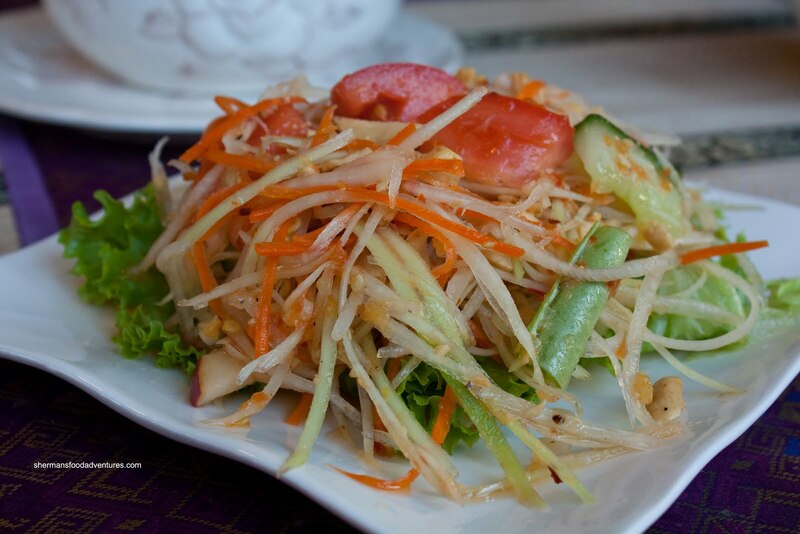 Next, we had the Green Papaya Salad. This was very fresh and vibrant consisting of julienned carrots, green papaya, apples and green beans. Texturally, this was a winner with plenty of crunch. Flavour wise, we found it leaning towards the tart and fish saucy side and lacking a bit in sweetness. To be fair, it is nitpicking. The salad was solid nonetheless. 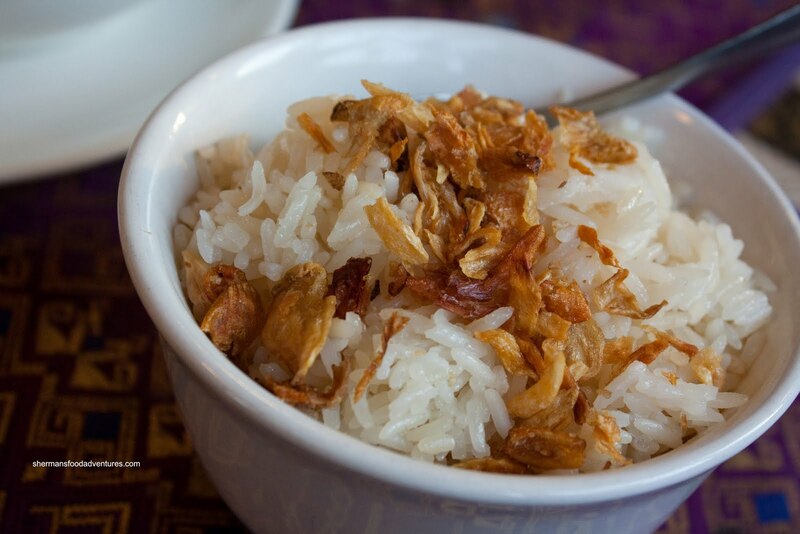 To go with the Green Curry, we got an order of the Coconut Rice. I know it's only rice; but we found it to be cooked perfectly. It had a nice chewy texture while being fluffy and fragrant. As for the Chicken Green Curry, let's just say it tasted better than it looked. With an obvious oil slick at the top and a rustic appearance, it was neither creamy nor watery. 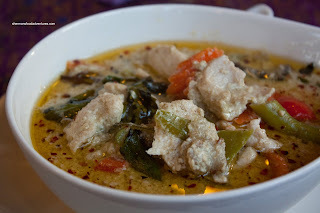 I've had many green curries where the coconut milk looks as if it has curdled and this was one of them. I think they might have cooked it at too high heat? Regardless of it's appearance, we found the curry to be not as flavourful as we would've liked. It could've stood to be both spicier and saltier (more fish sauce?). On the other hand, we enjoyed the Chicken Pad Thai. It could've had more of a tamarind zing to it; but at the very least, it was not ketchupy. 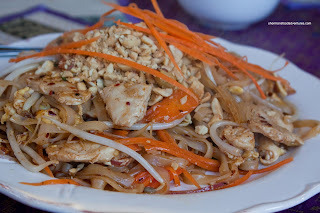 We found the rice noodles to be cooked perfectly as well as the other ingredients. However, we noticed that the pressed tofu and preserved turnip were missing from this version. This detracted slightly from what was probably the best dish of the meal. Interesting. Turns out the place wasn't as good as we had envisioned. Maybe we were expecting too much? Don't get me wrong. The food was alright. Yet, for the price we paid for our meal (which was $60.00), we didn't feel it was necessarily worth it. Too bad really, it had the "crappy-looking place in an odd location" going for it (or not). Not the best idea, but they lost badly so it was okay.